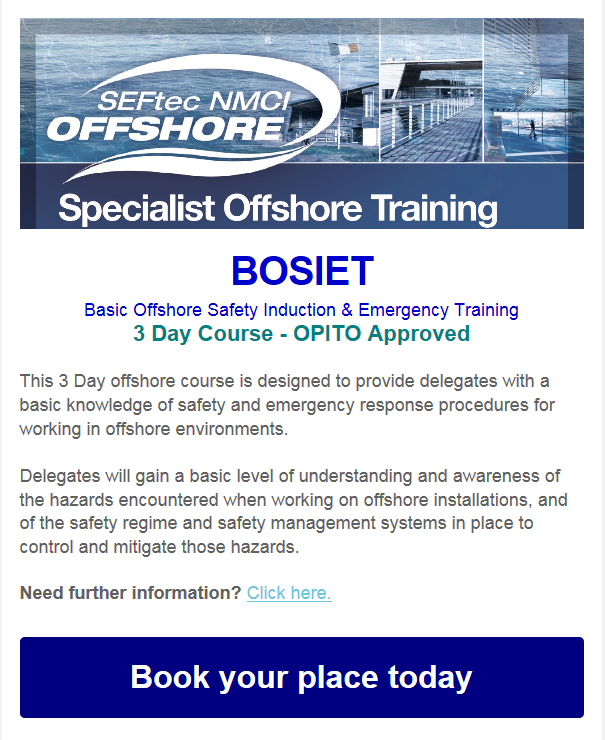 SEFtec NMCI Offshore will be running a BOSIET Course on April 20th at the National Maritime College of Ireland. This 3 Day offshore course is designed to provide delegates with a basic knowledge of safety and emergency response procedures for working in offshore environments. Delegates will gain a basic level of understanding and awareness of the hazards encountered when working on offshore installations, and of the safety regime and safety management systems in place to control and mitigate those hazards. The course is a mix of theoretical and practical sessions, during which delegates will be required to demonstrate their level of knowledge and understanding of the training programme content.